Rubbish Ruth's Rambles – Roaming around England by free Bus Pass, picking up at least one piece of rubbish every day. Author Ruth MajorPosted on 19th April 2019 19th April 2019 Categories UncategorisedLeave a comment on Funky, Fitness & Fun! Just when I think I can’t improve on my previous trips I’m proven wrong! Last week I spent 6 days in glorious sunshine (albeit somewhat cold) exploring the beautiful countryside of North Lincolnshire, Humberside, East Riding, North Yorkshire, Cleveland, County Durham and West Yorkshire before returning to find the hills around Oldham bathed in sunshine too! Everywhere there were lambs in the fields, daffodils along the roadsides and blossoms on the trees, all enhancing the most breath-taking scenery. To start my trip I caught the train to Hull and from thereon it was ‘bus pass’ travel to Grimsby, Hull, York, Whitby, Middlesbrough, Hartlepool, Darlington, Richmond, Ripon, Harrogate, Leeds, Bradford, Huddersfield and finally over the border into Greater Manchester where I boarded a (free) tram back into to Oldham . I travelled on 23 buses, stayed at 4 Anchor-Hanover Guest Rooms, visited 7 Wetherspoons’ pubs, researched my family history in 3 libraries and did 2 BBC Radio broadcasts about my adventures. Radio York invited me into their studios to talk, live, to their listeners and BBC Tees conducted a telephone broadcast whilst I was on a bus to Whitby! I spent £40 on accommodation, zilch on travel and my Wetherspoons bill is a secret! As ever, I picked up and ‘talked’ a load of rubbish, distributed my Social Media information cards to anyone and everyone who was prepared to listen about the #1PieceOfRubbish campaign and received lots of positive and encouraging reactions. A lovely volunteer in Age UK in Richmond was very complimentary about my efforts, students in Darlington promised to share my details with their friends, the staff at Hartlepool library were keen to inform their colleagues and a young man I met in Hull Interchange is now an ardent litter-picker! In an effort to show the route I was following, I bombarded you with pictures of rubbish going into various bins, photos of guest rooms and information about radio stations. I thank you all, most sincerely, for your responses, tweets, retweets, posts, shares, ‘likes’ and ‘loves’! Responding to every one of them is nigh on impossible but I appreciate your unerring interest in – and support for – the campaign. THANK YOU! Much love and gratitude to you all. Go gently! New boots, new Bus Pass Trip, new ADVENTURE!!! Author Ruth MajorPosted on 31st March 2019 31st March 2019 Categories UncategorisedLeave a comment on New Boots! I didn’t win an award but I ‘picked up’ a couple of hearts and spread the #1PieceOfRubbish campaign by ‘card-bombing’ dozens of people with my ‘business’ cards. Hopefully I’ve won over lots of important and influential hearts!!! 💚💚💚. It was an amazing experience… one I wouldn’t have missed for the world and that was ample reward in itself. 2 Minute Beach Clean at Butterfly Beach, Olu Deniz, Turkey….and I’m shaken AND stirred by this ‘toxic cocktail’, Mr Bond! 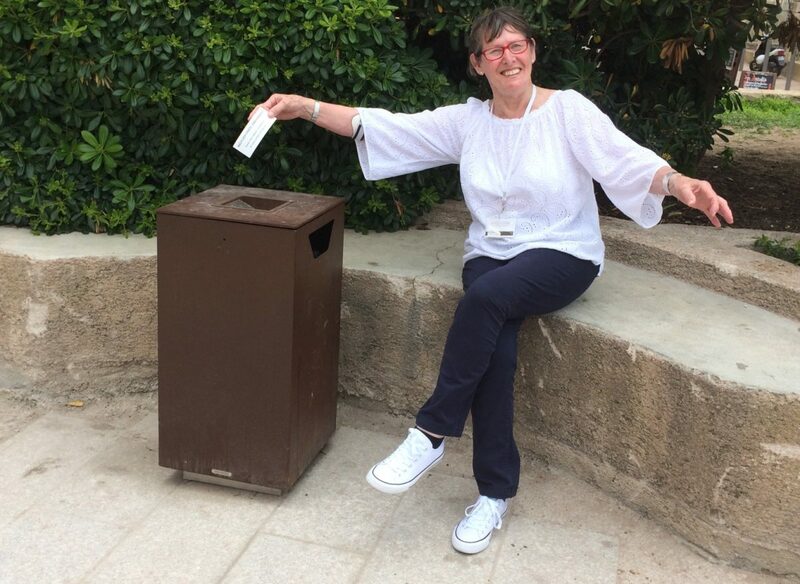 Author Ruth MajorPosted on 4th October 2018 9th October 2018 Categories #1pieceofrubbish, TravelsLeave a comment on “From Turkey With Love” – from 007! Author Ruth MajorPosted on 16th September 2018 16th September 2018 Categories UncategorisedLeave a comment on Buzzin’ ! Day 4: Manchester Airport, Wythenshawe Centre, Wythenshawe Hospital, Didsbury Village, Manchester United Football Ground, St Brides Church. Author Ruth MajorPosted on 7th September 2018 8th September 2018 Categories UncategorisedLeave a comment on Bee In The City…..Manchester! ‘Bee Buzy in the City. Please pick up #1PieceOfRubbish every day! Day 2: Media City, The Lowry Centre, Castlefield, Tony Wilson Place, Museum of Science & Industry, Manchester Fort. 13 big bees, 26 little bees.